Skyscraper-studded Frankfurt — with so much commerce it's nicknamed "Bankfurt" — has a delightful-to-explore old center. We'll also visit Nürnberg, a capital for both the First Reich (the Holy Roman Empire) and the Third. From its towering castle and playful fountains to its Nazi Documentation Center and maze of underground bomb shelters, Nürnberg is a fascinating study in contrasts. Finished in 2000, this tower houses the Helaba Bank and offers the best (and only public) viewpoint from the top of a Frankfurt skyscraper. A 55-second, ear-popping elevator ride to the 54th floor (watch the meter on the wall as you ascend) and then 50 stairs take you to the rooftop, 650 feet above the city. Sample your way through the ground floor is an adventure in fine eating (with a line of simple eateries upstairs, too), and a delight for photographers. The far wall is filled with a fun piece of art offering a bird's-eye view of Frankfurt over a charming montage of the many ways locals love their hometown. Frankfurt's market square was the birthplace of the city. This is the site of the first trade fairs (12th century), bank (1405), and stock exchange (1585). Now, crowds of tourists convene here. The Town Hall (Römer) houses the Kaisersaal, or Imperial Hall, where Holy Roman Emperors celebrated their coronations. Today, the Römer houses the city council and mayor's office. The cute row of half-timbered homes (rebuilt in 1983) opposite the Römer is typical of Frankfurt's quaint old center before the square was completely destroyed in World War II. Hosting everything from Christmas markets to violent demonstrations, this square is the beating heart of Frankfurt. In the Middle Ages, Holy Roman Emperors stayed here when they were camped out in Nürnberg, and the imperial regalia, including the imperial cross, imperial sword, and crown, were stored here from 1424 until 1796. While this huge complex has 45 buildings, only a few are open to the public. This sprawling, sweeping museum is gorgeously presented, nicely lit, and well-described by its audioguide. It occupies an interconnected maze of buildings, old and new, in the southern part of Nürnberg's Old Town, near the station and recommended hotels. The museum's star attraction is its German art collection, with works by Dürer (the only originals in town), Cranach, and Tilman Riemenschneider. Nürnberg's most famous resident lived in this house for the last 20 years of his life. Nothing in the museum is original (except the house itself, which survived WWII bombs) — all the paintings are replicas; the only Dürer originals in Nürnberg are in the Germanic National Museum. But the museum does a fine job of capturing the way Dürer actually lived, and it includes a replica of the workshop, with a working printing press, where he painted and printed his woodcuts. This once-Catholic, now-Protestant church is a massive house of worship. It was never a cathedral because Nürnberg never had a bishop (a fact locals were very proud of — a bishop would have threatened their prized independence). It sports an intricately carved, 260-foot-tall facade and a fascinating Gothic interior that's managed to survive the iconoclasm of the Reformation, the whitewashing of the Baroque age, and the bombing of World War II. Albert Speer, Hitler's favorite architect, designed this immense complex of buildings for the Nazi rallies. Not many of Hitler's ambitious plans were completed, but you can visit the courtyard of the Congress Hall, Zeppelin Field (where Hitler addressed his followers), and a few other remains. Figure an hour round-trip from the Documentation Center for the full circuit. If you have less time, just look into the courtyard of the Congress Hall from the perch at the end of your Documentation Center visit and then walk the short way around the lake directly to Zeppelin Field and back. This excellent museum meticulously traces the evolution of the National Socialist movement. Special attention is paid to Nürnberg's role in the Nazi movement, including the construction and use of the Rally Grounds, where Hitler's largest demonstrations took place. The museum is housed in one small wing of Hitler's cavernous, unfinished Congress Hall — the largest surviving example of Nazi architecture. The building was planned to host the mammoth annual Nazi Party gatherings. Today, it has been symbolically cut open by its modern entryway — exposing the guts and brains of the Nazi movement. Inside the museum, the exhibit is a one-way walk; allow at least two hours. WWII history buffs should allow an extra hour for the various 10-minute videos that play continuously throughout the exhibit, offering excellent insights into the mass hypnosis of the German nation. Exhibit descriptions are in German only, so the English audioguide is a must. 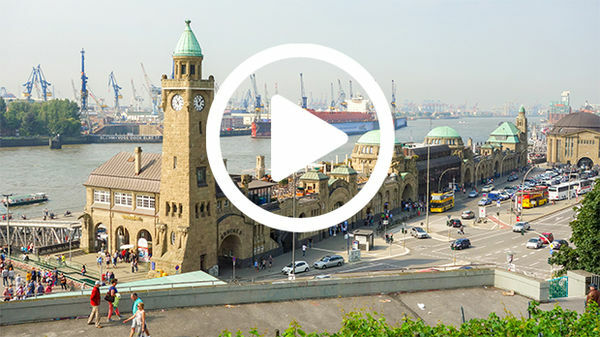 Hi I'm Rick Steves, back with more of the best of Europe — and this time we're cooking up some unforgettable German treats — that includes my favorite sausage anywhere…danke schön… We're in Frankfurt and Nürnberg. Thanks for joining us. Germany is Europe's economic powerhouse and you feel that in its great cities — like Frankfurt and Nürnberg. These are examples of how Germany has put the 20th century behind it and learned that the most effective way to be powerful is to be constructive. In Frankfurt, a city of contrasts, we see today's Germany — a vibrant mix of the new and the old, sprinkled with people-friendly zones, parks, and a stunning riverfront. Then, in Nürnberg, we marvel at remnants of Germany's First Reich — with the Holy Roman Emperor's castle — and we learn of Hitler and the Third Reich — with the architecture of a megalomaniac. Finally, we go underground — for a peek at history seldom seen. Dominating the north of Europe is Germany, the size of Montana. We start where many trans-Atlantic flights stop, in Frankfurt, and then travel a couple hours to Nürnberg. 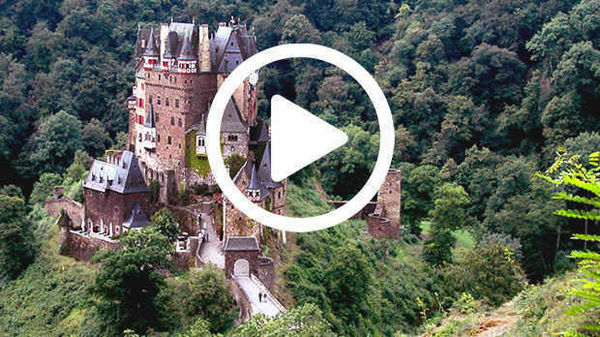 For an honest look at today's Germany, travelers need to venture beyond the ruined castles and cute cobbled towns. Frankfurt may be low on Old World charm, but it offers a great look at no-nonsense, modern Germany. Ever since the early Middle Ages, people have gathered here to trade. Today, cosmopolitan Frankfurt — nicknamed "Bankfurt" — is a trading hub of a united Europe, home to the European Central Bank, and a center for global commerce. With its trading heritage came people from around the world. You'll notice the strikingly multi-cultural flavor of the city. A quarter of its 700,000 residents carry foreign passports. Frankfurt is often avoided by tourists who consider it just a business and transportation hub. But, with its modern energy, Frankfurt is a unique and entertaining city well worth a look. The city, with its forest of skyscrapers perched on the banks of the Main River, has been dubbed Germany's "Main-hattan." While it leads the country in high-rises (mostly bank headquarters), it has plenty of people-friendly parks. In fact, Frankfurters boast that a third of their city is green space. This park is part of a greenbelt that circles the old center and marks the site of Frankfurt's long-gone medieval fortifications. Today that greenbelt weaves through Frankfurt's banking district. And history hides among these trees. The Marshall Plan — that massive American aid program that helped Germany rebuild after World War II — was administered from this building. After World War II, Germany was in ruins and its economy was in chaos. In 1948, the US gave it a complete currency transfer. It was like a blood transfusion — literally printing up the new German deutsche marks, shipping them across the Atlantic, and from here in Frankfurt, injecting them directly into the German economy. That aid helped rebuild Germany, and it shaped Frankfurt as well. And, as if attracted to all that money, banks naturally grew up right here. The architecture is striking. By law, no German worker can be kept out of natural light for more than four hours. That's why work environments are filled with windows. And, unlike any skyscraper I've been in, Germans have office towers with windows that open. The Main Tower is open to the public and offers a breath-taking view. From its rooftop, 650 feet high, you can survey the city. With new construction nearly obliterating the river upon which the city was founded, its ever-expanding skyline exudes the vitality of the German economy. In contrast to the glassy skyscrapers, Frankfurt's train station is a classic. This late 19th-century glass-and-iron construction somehow survived the bombs of World War II. The building's elegant façade dates from the Industrial Revolution, and shows the pride of that age: Atlas carries the world — but only with some heavy-duty modern help, as figures representing steam power and electricity pitch in. Stepping inside you feel the energy of Germany's busiest train station, where 350,000 travelers catch 1,800 trains every day. Kaiserstrasse, a grand 19th-century boulevard, was built to connect the station and the city with style. Towering above and beyond its fine 100-year-old facades and reflecting the glaring modernity of this ever-changing city, are the skyscrapers of Frankfurt's banking district. Frankfurt is full of contrasts. Just a few blocks away, under those same skyscrapers, is a red light district with about 20 legal brothels — the pragmatic result of a policy of tax and regulation to take the crime out of a reality that just won't go away. Just a couple of blocks away there are fashionable streets lined with top-end boutiques. People-friendly pedestrian zones make it easy for both shoppers and diners. And, on a hot day, people of all ages enjoy the refreshing fountain fronting Frankfurt's fine opera house. The many small German-speaking states finally united into modern Germany in about 1870. Within a couple of years Frankfurt, which helped spearhead the unification movement, built this fine opera house. It celebrated both high German culture and the newly created nation. While bombed in World War II, it was rebuilt it in the original style. Mozart, whose operas were a hit here, and the esteemed Frankfurt writer Goethe flank the entrance, reminders that this is a house of both music and theater. Lunchtime beneath the skyscrapers can be entertaining, as herds of bankers fill countless restaurants. This street is nicknamed "Fressgass'," roughly the "Feeding Street." As a contrast to the many trendy restaurant chains, Frankfurt's Kleinmarkthalle, that's "little market hall," is a delightful, old-school alternative. The venerable farmers market was saved from developers by a local outcry, and remains a neighborhood favorite. Explore…and enjoy the samples. Shopkeeper: This food is anti-aging. You have not need of it. This stall is all about German sausages. And amid this carnivore's delight hides this — the city's classic wiener, the frankfurter. My best market tip? Find the most popular eatery, get local advice, and go for the town specialty. Just around the corner is Römerberg, Frankfurt's old main square, lined with half-timbered buildings. Because of its historic importance, it's one of the few bits of the old town rebuilt after the war in its original medieval style. On a sunny day, people head for the Main River. A centerpiece of the riverside park is this welcoming 19th-century iron bridge. Enjoy the lively scene along the riverbanks in the shadow of Frankfurt's towering skyscrapers. Taking a riverside stroll, I'm struck by how Germans, while so productive in the workplace, are also expert at relaxation. From Frankfurt trains zip travelers to all points. Heading southeast, in a couple hours we cross into the state of Bavaria, and arrive in Nürnberg. Nürnberg was one of Germany's — in fact Europe's — leading cities 500 years ago, with an imposing Imperial Castle. The city's formidable walls were state of the art — they were redesigned from square towers, which worked just fine before the threat of cannon fire, to round ones — so enemy cannon balls were more likely to glance off without doing any damage. Back then, with 80 water wheels powering mills along its now sleepy river, Nürnberg was an industrial marvel. The scenic remnants of its hard medieval past are now just an added dimension of a delightfully people-friendly historic center. Ninety percent of downtown Nürnberg was destroyed in 1945. To rebuild, city fathers had a choice: go entirely modern like Frankfurt did — that was the Manhattan plan — or, maintain the pre-war footprint and rebuild modern while preserving the traditional character — that was Nürnberg's choice. With one of Europe's largest pedestrian zones, the city of half a million has the charm of a smaller town. Playful street art, a series of bridges with scenic river views, and no traffic noise, make it a joy to experience. Nürnberg is dominated by its mighty castle. 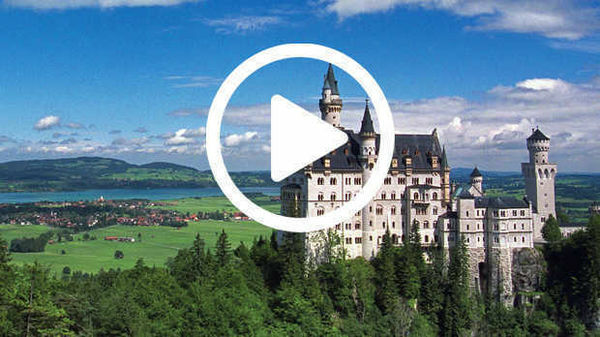 In the Middle Ages, Holy Roman Emperors — Europe's most powerful rulers — stayed here when in town. The Holy Roman Emperor ruled much of Europe for over a thousand years. The institution was finally ended by Napoleon in 1806. The emperor ruled a vast realm — it was bigger than today's Germany — but it was never centralized like France or England. Rather than inheriting his power, he was elected by the top bishops and nobles of the day — they were called "prince electors." The emperor had to keep on the move, and didn't have a real capital city. While the emperor claimed supreme authority inherited direct from the emperors of ancient Rome, historians like to joke that the Holy Roman Empire was neither holy, nor Roman, nor an empire. The most famous of these medieval emperors was Charlemagne — shown here in a painting by Nürnberg artist Albrecht Dürer. Charlemagne — or Charles the Great — was crowned by the pope in the year 800. When ruling from Nürnberg, the emperor would have received visiting delegations in the castle's Lower Hall. It's empty of furniture because the imperial court was mobile. Each city would scramble to suitably furnish its royal quarters before the emperor arrived. The castle's 800-year-old church is Romanesque in style, and gives a peek at how structured even medieval society's top one percent was. It has a triple-decker design: The lower nobility worshipped from the lower level, the upper nobility worshipped at this level, and the emperor, he worshipped above everybody else — from the balcony. As effective as the castle fortifications were, there was always an ultra-secure refuge of last resort — the towering keep. And security required more than stony towers. Any good castle needs a secure water source within its walls. And when your castle sits on a high rock, you need a very deep well. This castle illustrates that in a fun and memorable way. Even without understanding much of our guide's German, he made it really clear that this well goes way, way down. Nürnberg's Germanic National Museum is dedicated to sharing the cultural history of the German-speaking world. For German-history buffs, this museum alone — with a vast and gorgeously presented collection — makes a visit to Nürnberg worthwhile. When it comes to Germany's reputation for fine craftsmanship, its passion for quality goes way back. These finely crafted, centuries-old precision instruments were intricate, innovative, and artful. This is the world's oldest surviving globe — crafted by a Nürnberger. Since it dates from 1492, the Americas are missing. While they understood that the world was round, the Western Hemisphere was still just a huge and mysterious sea. The delicate wooden Nürnberg Madonna is also 500 years old. This intimate, anonymous carving of the favorite hometown girl was a symbol of the city for centuries. The German painter Lucas Cranach was famous for portraits of his contemporaries — like the great German reformer, Martin Luther. Cranach also painted poignant psychological studies — paintings that came with a message. In The Ill-Matched Couple the lecherous old man thinks he's got the young maiden. But she looks knowingly out at us, as if to say "he's a fool and he'll get nowhere with me." The great painter Albrecht Dürer worked in Nürnberg around the year 1500. This is a self-portrait of that ultimate German artist. Dürer, who was from the same generation as Michelangelo and Leonardo, was in tune with the Renaissance. He was a genius with a curious mind, a love of nature, and a passion for realism. After traveling to Italy and seeing how artists were becoming well-paid and respected, rather than anonymous laborers, he returned to Germany bringing the spirit of the Renaissance with him. He painted this portrait of his mother when he was a teenager. While just 19, his passion for realistic detail is already apparent. This painting, of Dürer's teacher, was done after his experience in Italy. Its realism was unprecedented in Germany…and it's signed. Again, now the artist will be respected and he proudly included his initials, AD. Dürer was a master at producing engravings made from finely etched metal plates. The detail and realism — a trademark of Dürer — is extraordinary. As he was famous in his own time, and because many prints could be made from a single master plate and therefore sold affordably, the engraving technique enabled Dürer to become the first best-selling artist in history. And he made a lot of money — enough to purchase this impressive mansion beneath the castle. Today, it's a fine museum about the life of perhaps Germany's greatest painter. A visit here includes a workshop where you can learn about Dürer's craft. It's with these tools that the artist engraves an image into the copper plate. Visitors are treated to a demonstration of making a print from the plate. The subject is a hare — Dürer was famous for his vivid portrayals of the natural world. To be able to enjoy such beautiful, yet mass-produced art, must have been a marvel 500 years ago. A few blocks away, towering nearly 300 feet above the pedestrians, is St. Lawrence Church. When emperors paraded into town, they'd approach its magnificent facade head-on. Stepping inside you feel the splendor of that age. Suspended over the altar is the Annunciation, by the great Nürnberg woodcarver, Veit Stoss. Carved in 1517, it shows the angel Gabriel telling Mary that she'll be giving birth to the Messiah. Startled, she drops her prayer book. The dove represents the Holy Spirit. And God — looking as powerful as a Holy Roman Emperor — looks down. This lacy tabernacle is rich enough to hold the consecrated Communion wafer — which Catholics consider the "body of Christ." And supporting the tower on his shoulders is the artist who created it, Adam Kraft — gripping his noble tools with a proud confidence. Again, this was around 1500, and the humanistic spirit of the Renaissance was moving into Germany. While this church, along with the rest of the city, was heavily bombed in World War II, much of its art survived, thanks to heroic and creative efforts by its citizens. One part of Nürnberg that avoided bomb damage was underground — its vast and long-established network of waterways, tunnels, and beer cellars. They were outfitted as air-raid shelters. During bombing raids tens of thousands of locals took refuge down here. It's also where countless art treasures — both local and looted — were safely hidden away. To learn more about this — and not get forever lost down here — we're joined by my friend and fellow tour guide Thomas Schmechtig. Thomas: So, Nürnberg was bombed quite late in the war, and we saw what happened to other cities, so we actually prepared for the war, and reconverted these old beer cellars into air-raid shelters. That, for example, [is] where guards used to be who protected the artworks, which were stored in here during the second world war. The Nazis hid crates of great art in many different rooms in this sprawling underground network. Thomas: This is one of the many rooms down here which were filled up with art. Nürnberg was back then nicknamed the "treasure chest of the German Empire." Plus, the Nazis looted lots of artworks. Rick: From countries that they'd conquered, and they brought it here? Thomas: Correct. For example, right in this room, they had the crown of the Holy Roman Emperor. Rick: So, right here in these cellars were some of the great treasures of European culture. Thomas: Correct. We didn't just stash the art treasures down here — they were carefully packed. For example, here Rick, you see the wonderful stained-glass windows from our St. Lawrence Church. They were taken out pane by pane, and then put into those wooden crates. Thomas: The humidity was very dangerous for the artworks, so they air conditioned the whole place in here. Rick: So, this huge duct was made in anticipation of the war? Thomas: Yes, and already in 1939, before the war broke out. The bombing, of course, eventually came. And this surviving underground network became the foundation for rebuilding the city. Thomas: So it did make sense to rebuild the city on its original footprints. We have miles of underground, which survived the war. They date back to the Middle Ages — that, for example is an old water-conduit system. Nürnberg, so steeped in German history, was nicknamed the "most German of German cities." That's one reason it was a favorite of Hitler's. A short tram ride from the center is a collection of important Nazi sites. When Hitler took power in 1933, he made Nürnberg's Zeppelin Field the site of his enormous Nazi Party rallies. The stark remains of this massive gathering place are thought-provoking. For several years, increasingly elaborate celebrations of Nazi culture, ideology, and power took place right here. Thomas: Imagine, Hitler stepping out of that door, overlooking the masses — 200,000 people being lined up. He used propaganda to create a new community — in fact we even have a word for it: It's called "Volksgemeinschaft." The chilling images from Leni Riefenstahl's documentary Triumph of the Will were filmed at the 1934 Nürnberg rallies, and then shown in every theater and schoolroom in the country. The goal? To bring a visual celebration of the power of the Nazi state to every person in Germany. Looming over a now peaceful lake is another remnant of the dictator's megalomania — his huge-yet-unfinished Nazi Congress Hall. Hitler was enamored with the Roman Colosseum. He had his congress hall modeled on that…but built much bigger. Thomas: Imagine — 50,000 leading Nazis in here. One third higher, covered by a roof. A window inside the ceiling, sunshine would have fallen down to the podium. Once a year, one speech, of Adolf Hitler. Thomas: Adolf Hitler liked huge buildings. He was a big fan of the architectural style named Neoclassicism. The idea was to make the individual feel small. Rick: This really makes me feel small here. Thomas: Yeah, you give away the responsibility of your life and you get something back in return. That is, a bright new future. The Nazi Documentation Center fills one small wing of the hall. This superb museum does its best to answer the question: "How could Germany's Nazi nightmare have happened?" It traces the evolution of the Nazi movement, focusing on how it somehow both energized and terrified the German people. This is not a WWII or Holocaust museum; in fact, those events are barely mentioned. Instead, the center frankly analyzes the origin and evolution of the Nazi phenomenon, to help better understand it and to help prevent it from ever happening again. Exhibits offer insights into the creation of the Messiah/pop star image of Hitler — the mass hypnosis of the German nation. You'll see his manifesto Mein Kampf, mementos that placed the dictator alongside Bismarck and Beethoven in the pantheon of German greats, and souvenirs from his rallies. With postcards like these, the Hitler-mania generated by these rallies was shared across the land . Of course, Hitler's promises were trumped up, and led not to glory but to war, the Holocaust, and the devastation of Germany. The challenges of building and maintaining a peaceful future are ongoing. Thomas: Incorporated into these museums are classrooms like this. Thomas: Because every student, military, policeman should learn from our difficult history. Rick: So this really is, today, part of German education. Thomas: Yeah. It finally arrived in our education system. Having learned powerful lessons from its 20th-century history, today Nürnberg celebrates its German character with a forward-looking gusto that seems to really value life. You feel that throughout the town: the farmers who sell their produce direct from stalls on the bridge…fountains designed to make kids giggle, along with their parents…and its tasty traditions. Here in Nürnberg you'll certainly eat well: famous beer, classic pretzels, sauerkraut, and the thing about this city that steals my heart: these adorable little sausages. Thanks for joining us. I'm Rick Steves. Until next time, keep on travelin'. Guten Appetit and auf Wiedersehen.